A dental implant is a small "anchor" made of titanium. It is inserted into the jawbone to take the place of your missing tooth root. After osseointegration, or when the surrounding bone has attached to the implant, a replacement tooth is secured to the top of the implant. 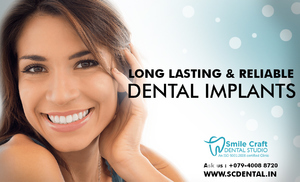 Dr Nirali patel is the best dental Implants specialist, provides single implant, multipe implant, full mouth implant and other types of implants treatments in Ahmedabad, India. Contact us now on (91) 079-40088720 and fix the appointment.